Hello, everyone -- Today I am sharing with you a fun product I recently tried, Terial Magic, now available from Imagination International. Terial Magic is a liquid fabric stabilizer that turns fabric into a fray-free, paper-like material which can be manipulated in ways that were previously unavailable. This obviously makes it perfect for anyone who sews or quilts, but it is also great for papercrafters! Once fabric is treated, you can stamp on it, die-cut it, run it through your digital die cutting machine, even PRINT digital images onto it using your personal printer -- and I can't wait to share a product I created doing that! It’s amazing for creating fabric flowers, bows and so much more. I can't wait to share more projects I made with it in the future! Step 2: I laid the fabric onto my self-healing cutting mat to air dry for a little while, because of the next step. Step 3: Because I was lazy and didn't want to get out my iron if I didn't absolutely HAVE to, I tried to finish drying the fabric with my heat embossing tool and that worked great ... Another score for crafting products!! Now if that heat tool would iron the rest of our household's laundry, we'd be all set, LOL! Once your project is complete, Terial Magic can be left in the fabric or washed out if the stabilizing quality is no longer needed. You can read more about Terial Magic, as well as find answers to frequently asked questions HERE. See how nice and clean the treated fabric cut?!! The Terial Magic helps to stabilize fabrics so well, even using very intricate dies yield great results! After cutting all three sizes of dies from coordinating fabrics, I tried gold heat embossing the flower center with its coordinating stamp set, Mondo Magnolia, and it worked beautifully! You don't get the norm deeply raised image like you would on cardstock, because most of the embossing sinks into the fabric, but it does give great texture (slightly raised) and color! Lastly, I die cut Essentials by Ellen Brushstroke Hello three times from 100 Lb. Neenah Solar White cardstock, stacked and glued them together, then topped them with another die cut from gold glitter paper, to match the gold embossed flower center ... ooh-la-la!! I would love to hear your ideas on how you would use Terial Magic and see your creations -- I think the possibilities are endless! Happy 8th Birthday Taylored Expressions! Happy Monday to you, friends! Did you know Taylored Expressions is celebrating its 8th birthday this month with some fun party favors for YOU! These include everything from the exclusive WISH BIG stamp & die combo set I’ve used today, to patterned paper packs, ink, and more! Visit the TE Blog to see all their special offers and for your chance to win a fun prize! I was so very honored to be a part of the first Baker's Dozen Design Team when Taylor started the company 8 years ago (remember Cuppie?!! ), and just as honored to be asked to help them celebrate their birthday this month! Here's a peek at the adorable Wish Big stamp set, which you can receive FREE with your purchase over $50 this month! From left to right: 1-spun sugar (4) & worn lipstick (7); 2-picked raspberry (1) & festive berries (11); 3-abandoned coral (13) & carved pumpkin (15); 4-twisted citron (14) & mowed lawn (2); 5-cracked pistachio (13) & lucky clover (15); 6-tumbled glass (8) & broken china (6); 7-shaded lilac (4) & wilted violet (15). Next, I stamped the "happy" and "wish" words onto watercolor cardstock, die cut them with their coordinating dies (included in this FREE set!) and watercolored them with the same Distress Inks. Then I either punched holes into the words and tied the embroidery thread through the holes or just around the letter, securing the thread on the backs of the die cut words with foam tape. Mini Glue Dots hold the threads to the balloons. The "BIG" and "Birthday" words were stamped with Taylored Expressions Oreo ink onto the background. The watercolor panel was trimmed 1/4-inch along the bottom and mounted with foam tape to a Sugar Cube card base with gold dot foil washi tape along the bottom edge. To finish the card, I used Zig Wink of Stella Glitter Gold Brush pen to create a splattering of confetti over the card. To do this, just squeeze the barrel of the pen like you would a waterbrush, to get some of the ink to flow out. Then tap the pen against your fingers/hand to splatter the ink onto the card! I hope you will visit the Taylored Expressions blog all this week, as they give you some fun sneak peeks of their birthday release coming this Thursday, September 1st, when you will have the chance to make your purchases in order to receive this adorable FREE stamp and die set combo! Hello, friends! I'm back today with another beachy pineappley project for you! Can you tell I slightly LOVE just about anything tropical and beachy?!! I'm desperately trying to hold on to the last bit of Summer (before school starts next week), by scrapping one of my favorite photos from our vacation a few short weeks ago (I am SO ready to go back)! I hope you'll join me today over in Ellen Hutson's the CLASSroom for all the details on how I created this page. As promised, I've included detailed photo instructions on how to create the stamped watercolor pineapple I used here and on my pina colada card in the post below this one. I look forward to seeing you there! Essentials by Ellen Late Summer 2016 Release! I absolutely adore pineapples and this set has some FABULOUS coordinating sentiments ... I couldn't pass up this pina colada one (since it's one of my favorite tropical drinks)! The pineapple stamps are offered in a 2-step type stamp for the largest pineapple (with separate greenery top), and two smaller one-piece solid pineapple stamps! You can either use the large pineapple two stamps together, or maybe just the criss-cross outline, if you want the option to hand color it with markers or pencils = great versatility! To create the large pineapple "cup" I used #52 Bright Yellow Zig Clean Color Real Brush Marker on the solid pineapple, lightly spritzed it with water, then stamped it onto watercolor paper. Once the base was dry, I used #61 Light Brown Zig to color the criss-cross pineapple the same way I did the base (spritz with water, then stamp). Once the pineapple was dry, I die cut it with its coordinating die, then took the middle pineapple die and used the side of the pineapple to cut the top off my stamped & die cut pineapple, to create the cup! The green pineapple top was created with a base layer of Zig #41 Light Green and shaded with #40 Green by coloring directly on the stamp. I'll have some more detailed step-out photos of how to create this pineapple with the Zig Clean Color Real Brush Markers this Friday over in Ellen Hutson's the CLASSroom -- I hope you'll join me then! The drink straw was created by just hand coloring a scrap piece of watercolor paper with #36 Light Blue Zig marker and giving it stripes with #31 Cobalt Blue. The vertical border of pineapples on the left side of the card base was made with the smallest solid pineapple, colored the same way with the Zig Clean Color markers -- I love the vibrancy of these watercolor markers! The sentiments were stamped with Jet Black Archival ink and my Misti Stamping Tool. The Misti is very helpful when stamping on textured watercolor paper. The bumpy surface sometimes takes multiple stampings to achieve a good solid coverage and the Misti is a lifesaver! This unique die set includes two mirrored image 180-degree sunray dies. I used them both -- one on top and the other on bottom, to create a full 360-degree sunray image! The other unique thing about these dies is that the "rays" are cut all the way through your cardstock, but still connected at the top and bottom = genius! I die cut the sunrays, cloud and Sunshine Words from white cardstock and then colored them with these Copic markers: Y13,19; YR02,12,14,09. The cloud was lightly colored along the bottom with Copic BG0000. The Hello sentiment from the Lovely stamp set was gold heat embossed. To finish the card, I popped the sunray panel up over a layer of gorgeous gold glitter cardstock and finished with a sprinkling of 4, 6, and 8mm Clear Pretty Pink Posh sequins. I also get to give away an Essentials by Ellen stamp set! 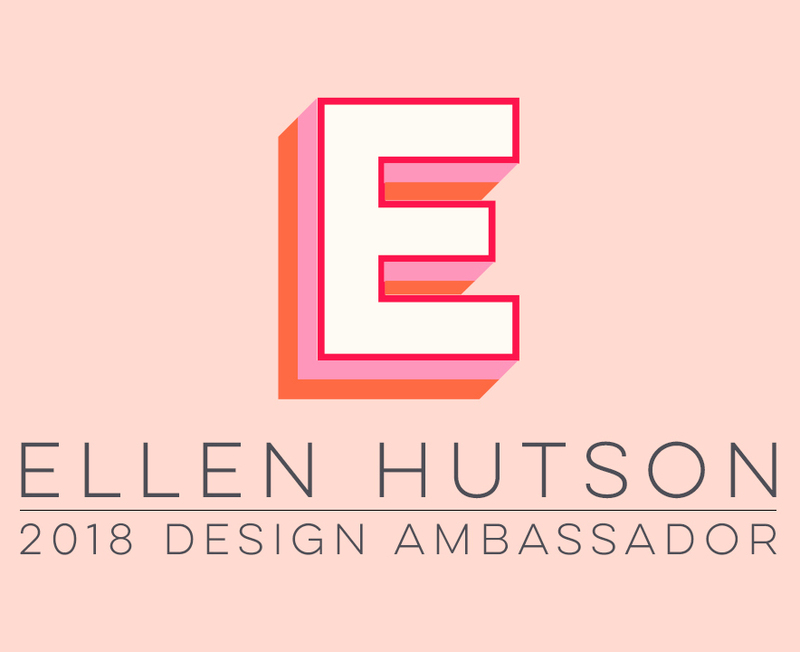 The winner may chose ANY Essentials by Ellen brand stamp set (maximum value $25 USD) currently in stock at EllenHutson.com. To enter my giveaway, please leave a comment on today’s post by Tuesday, August 23. There is also a crazy good Grand Giveaway in the CLASSroom! <--To enter, be sure to leave a comment there, also by Tuesday, August 23. ALL winners will be announced at the CLASSroom on Friday, August 26. Please check there on that date to see if you are a winner and for further details on claiming your prize. You should have come to my blog via Kristie Goulet's blog on the hop. If you get lost along the hop, please visit the CLASSroom blog for a complete list of all the designers. Next on the hop is my sweet and talented friend -----> Broni Holcombe! Happy Friday, friends! Today I'm sharing a fun felt project over in Ellen Hutson's the CLASSroom ... lovely lavender scented sachets! I hope you'll join me there for all the details on how to create them, with your Taylored Expressions felt (my very favorite felt of all time!) and Memory Box Plush dies! See you there!